I got the idea for this one last week from a poster on the bump. I couldn’t find a recipe on-line, so I had to wing it, but was pleasantly surprised! This is another Oliver approved breakfast! Preheat your oven to 375°F. Grease (hello Pam) a mini loaf tin pan or large muffin tin pan. Make the stuffing as per the box directions. While the stuffing is resting, brown the sausage in a medium fry pan over med-high heat along with the Italian seasoning, poultry seasoning, old bay seasoning and pepper. Remove the cooked sausage from the pan and drain any excess fat. 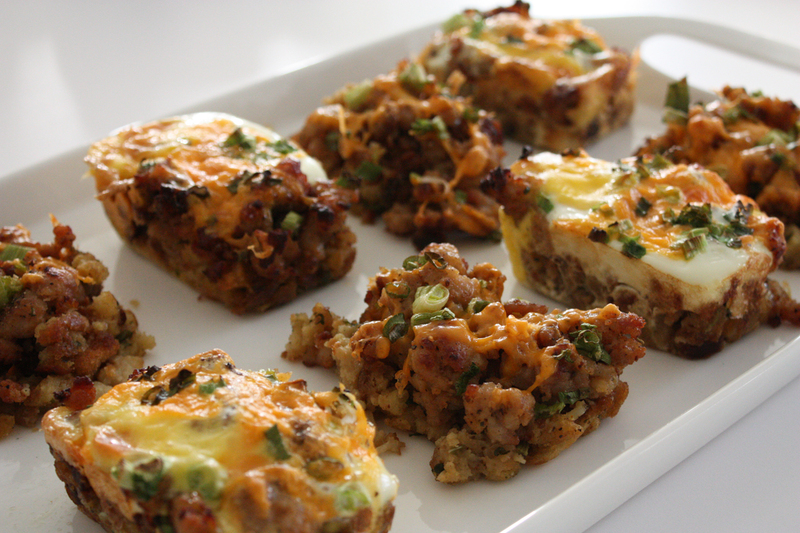 In each loaf pan, place ¼ cup of the stuffing mixture, then top with ¼ cup of sausage. Crack an egg into 4 of the loaf pans and sprinkle a little bit of salt and pepper on top of the egg. Top each of the loafs with some grated cheddar cheese diced green onion. Tent with foil and bake for 15 minutes. Remove the foil, poke the egg yolks (if you don’t want them runny), and continue to bake for 5 more minutes, or until the eggs are completely cooked and the cheese is melted. NOTE: Feel free to crack an egg on each of the loafs. With the egg, one loaf is a large enough serving for someone, as long as there’s some fruit or something on the side. We each ate 1 loaf with egg, and 1 loaf without.